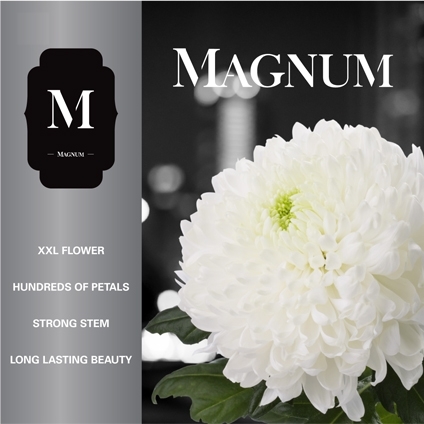 The word ‘magnum’ means ‘big’, and this is exactly why we called this disbudded chrysanthemum Magnum. Its flower is huge: to call Magnum a size XXL is no exaggeration! Not only does its flower get even bigger in the vase as the weeks go by, but it also becomes more spherical. This large eye-catching white flower with bright green at its centre is simply packed with petals. In fact, Magnum has so many ray petals that the flower never opens completely to reveal any disc petals in its centre, even after weeks in the vase. Magnum is an ultra-strong variety that has passed every transport and post-harvest shelf life test with ease – and without any sign of petal damage or loss. These chrysanthemums are delivered in a net – not to prevent any damage but simply to get enough of these large flowers into their box. 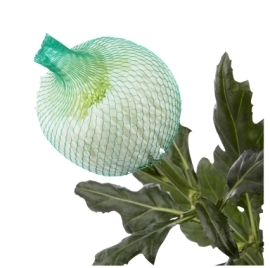 This unique flower with its high petal count, sturdy stems and beautiful green leaves has already reaped rave reviews. With the introduction of Magnum, Deliflor is taking a new step in chrysanthemums. Magnum will become available in quantities of around 40,000 stems on March, 29th. Part 2 of the Magnum movie: "Romance is in the air"